I recently visited my family in Southern New Mexico. While I was there I was introduced to a family friend, a Native American from the Mescalero Apache tribe, whom I will refer to as Tommy. The Mescalero Apache were a nomadic tribe that kept very little in the way of physical belongings, and they preserved their cultural history through storytelling. Tommy is one of those storytellers, and over the course of two days he shared many stories with me. The stories that intrigued me most were the ones about how skilled Apache warriors developed partnerships with their horses. As I listened, I began to hear training strategies that were familiar to me, even though Tommy never used the words “teaching,” or “training”. Skilled observers of behavior see and use what works and avoid what does not. I was reminded of what Susan Friedman always says, “behavior is a natural science.” People who work with animals often come up with similar solutions to problems, even if they are not exposed to the science, because the laws of learning are always at play. Skilled observers of behavior see and use what works and avoid what does not. I hope you will recognize the science hidden within the stories Tommy told me. Rather than bog down Tommy’s stories with my interpretations, I have chosen to share the stories the way he told them and provide numerical references that you can read later with my thoughts about each story. We have not always been horse people. The Apaches had never seen horses before the 1500s, when they were introduced into our mountains by the Spaniards. When we first saw horses, we thought they were odd creatures and we called them Big Dogs. We recognized the advantages of riding horses, though, and our warriors became expert horsemen, much better than the Spaniards or the Whitemen that followed. 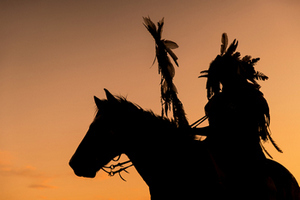 After horses were welcomed into our tribe, they became essential to the warrior’s way of life. There were many skills required to become a full Mescalero Apache warrior: accuracy with a weapon, stealth, knowledge of the land, tracking skills, and a partnership with a horse. A warrior’s horse was a true partner. Not all horses became warrior partners; the horses had to prove that they were brave and would not be fearful in battle. Many Apache enemies used guns, and gunfire would startle young horses. The bow and arrow were preferred weapons for Apache warriors, but our young men were trained in the use of rifles. During rifle practice, young men not participating in practice would be in the field with their horses. As soon as rifle practice began, the young men would hang bags of grain around their horses’ necks, allowing each horse to feed.3 Horses that remained calm became warrior partners, and they were no longer fed during rifle practice. The best horses would seek out their warrior partner during rifle practice, requesting to go into battle. Because there was no battle, the warrior would appease his horse partner by providing his horse with a bag of grain.4 Warriors took great pride in the fact that their horse wanted to go to battle. When you look at stories like this, you can see the laws of behavior at work. As I listened to Tommy’s stories, I appreciated the perspective the Mescalero Apaches had about their relationship with their horses. I was fascinated by the training that was clearly taking place, and the techniques that were used long before they were given names by Thorndike, Watson, Skinner, or Pavlov. When you look at stories like this, you can see the laws of behavior at work. I find this fascinating and enjoy digging deeper into traditional stories to try to understand the science at work. I was pleased that Tommy gave me permission to recount these stories and spent so much time answering my questions. I hope you found them as interesting as I did. Listening to Tommy’s stories, I always tried to read between the lines. I asked many questions, and the story as I have related it includes the original story along with the answers to my questions. 1This appears to be an early example of husbandry training, teaching the horse to cooperate in its own care. Apparently, the horses offered the foot voluntarily for the reinforcement of the soothing feel and comfort provided. I asked whether the warrior prodded or pulled at the foot to get the horse to lift it, but Tommy insisted that it was always the horse’s choice to lift the foot on its own. In fact, it was considered one of many signs that a true partnership was developing. 2There are many ways to interpret this part of the story. I chose to look at the goal of avoiding saddles, spurs, and bits to be an example of truly caring for the horse and trying to put welfare first. I suppose it could be seen as a macho ritual that had nothing to do with respect, but my feeling and sense from Tommy was that the warrior truly cared about his horse and had great respect for the horse and their partnership. 4The “request to go to battle” is an interesting way to describe what is taking place, but it is a great example of the stories that we often develop to explain behavior. I think these were experienced horses that had learned that the sound of rifles meant food, and they learned to seek their warrior out when the grain was not offered immediately. Let's Get Clicking! From "Clicker Training for Your Horse"